Swimmable beaches can be hard to find in Los Cabos, Mexico. 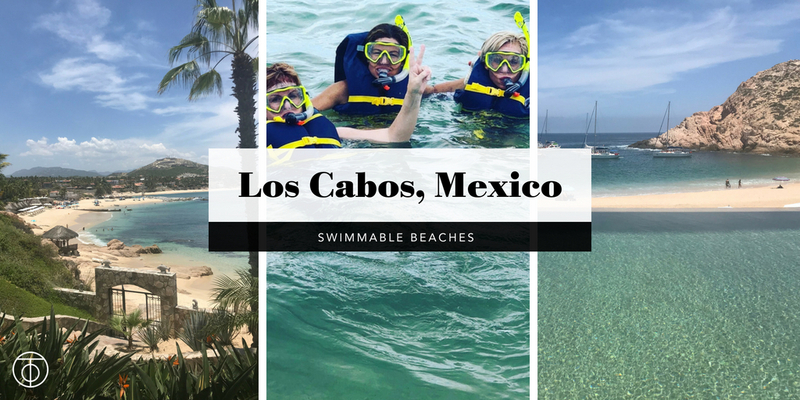 But leave your bagged lunch and cooler of cervezas behind because we know there’s more to Cabo’s swimmable beaches than a water taxi to Lover’s Beach! Visit some of our favorite luxury resorts with swimmable beaches and let someone else set up your beach umbrella. At Montage Los Cabos, the coveted Santa Maria Bay Beach is your backyard. 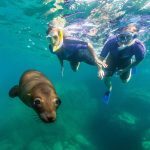 A playground for outdoor enthusiasts and a sanctuary for marine life, this beach is perfect for snorkeling. The calm and shallow waters and large beachfront also make it great for kids. This beach draws in more tourists by boat, than by foot, but it also feels the most remote. 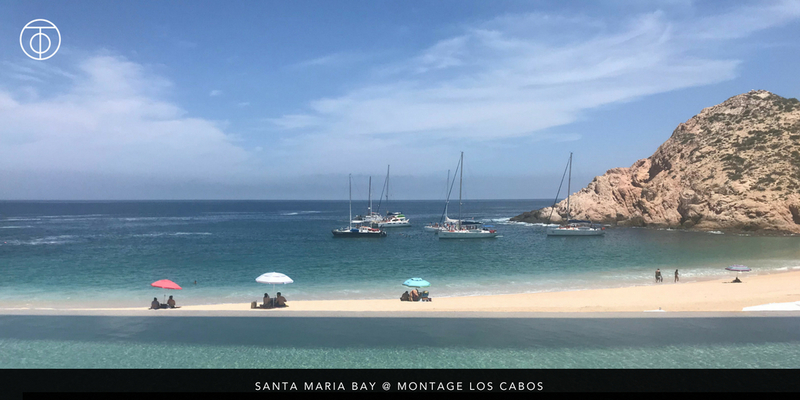 Read more about Montage Los Cabos in the hotel site-inspection blog post. 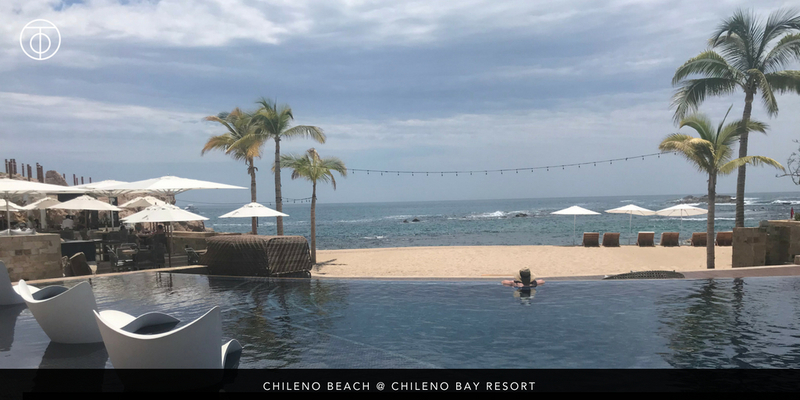 As a guest at Chileno Bay Resort, you have exclusive access to their H2O Sports Cave at Chileno Beach, making it the ideal launch point for paddle boarding, snorkeling, kayaking and more. Given its location in the tourist corridor, this beach in particular draws a bigger crowd than the other beaches. However, I wouldn’t let that stop you from visiting. It’s still a top-notch fun hotel that is perfect for both couples and families and the beach is a huge selling point. You might even spot some sea turtles! While Chileno Bay is not a member of Virtuoso (yet! ), we are often able to include some complimentary perks like a breakfast amenity or a resort credit through our valued partners at Auberge Resorts and Island Destinations. 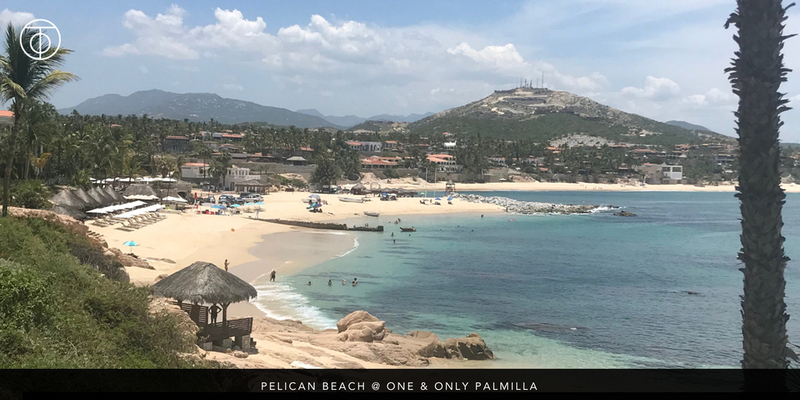 Pelican Beach, also known as Palmilla Beach, is another swimmable beach option at One&Only Palmilla complete with shaded cabanas, lounge chairs, and beach grill. Mezcal margarita, coming right up! This beach felt the most secluded from a privacy standpoint. There is an organic rock wall that creates an informal division between the One&Only and the public side of the beach. Rest assured, there is noticeable beach security here! One & Only Palmilla is one of our strongest go-to resorts for top-notch service anywhere in the world! Our clients love the genuine and thoughtful hospitality and care they receive from our friends at One & Only Palmilla and these great Virtuoso amenities are the cherry on the cake! It’s important to note all beaches in Cabo are public, and no beach is truly private. However, each of these luxury resorts has their own dedicated beach areas that are exclusive to guests only, with many inclusive water sports and beach activities. You’ll find that each of these luxury hotels also features privacy gates and/or beach security, making it impossible for the general public to access the hotel grounds without being a guest on the property. Santa Maria Bay Beach, Chileno Beach and Pelican Beach have each earned international Blue Flag certification, signifying the highest environmental and water quality standards. The only question is, which of these luxury resorts is the right fit for you? Tell us… where do you want to go next? 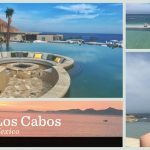 This entry was posted in Beaches, Mexico and tagged Beach vacation, Chileno Bay, family destination, Los Cabos, Mexico, Montage, One & Only, Virtuoso. Bookmark the permalink.